The purpose of a blog aggregator is to provide a system by which users are connected with various perspectives and expertise from many bloggers. 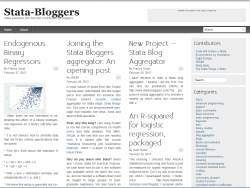 If you have favorite Stata bloggers who you think would appreciate the additional publicity from such an aggregator, please suggest that they contact me. For the blogger, there is very little they have to do. All I need is a feed from their blog. The aggregation software will do the rest. You should get The Stata Things. It's one of the remaining active ones. Code and Culture also has awesome Stata posts, but I believe the author has been transitioning to R, like many. I don't know how this aggregator works, but I hope you can aggregate only one category of a blog, provided that the blog engine produces a separate RSS feed for each category. I have a blog in French with some Stata content, perhaps I could set up a category to post Stata stuff in English from there. I had several options, as I also run a Tumblr with some Stata-related things. The Tumblr is a companion to a Stata course that I teach in Paris. I would gladly have this feed indexed by your aggregator, and will post only blog articles to it, rather than typical Tumblr reposts. Cool! Just checked and the post appears in Stata Bloggers. That will be my incentive to post more structured things about Stata in the coming weeks. Thanks again for your efforts. Sounds good, I just sent him a message.